November 18, 2013 By Allyson 14 Comments This post may contain affiliate links. Read my disclosure policy. 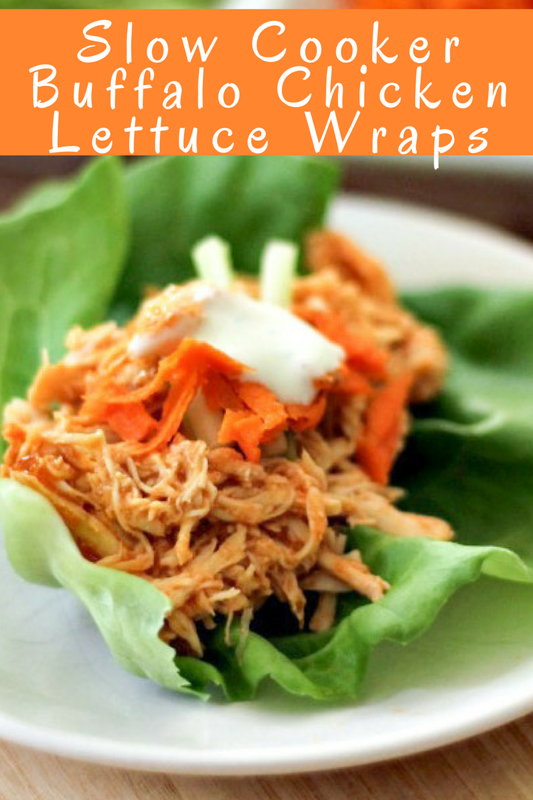 Slow Cooker Buffalo Chicken Lettuce Wraps are healthy, easy to make, and pack a ton of flavor! With tons of protein and barely any carbs, it’s the perfect healthy recipe! Before I became a vegetarian I pretty much at buffalo chicken all the time. It comes in so many different forms, and I was a sucker for all of them. Being my go-to meal when we were out to eat at a casual restaurant, it was hard to find a good replacement once I gave up meat. However after a few months with no buffalo chicken, I realized it wasn’t the chicken I was missing, it was the sauce! Buffalo sauce can be drenched on anything, and it takes on the great buffalo taste. Another downfall of buffalo chicken sandwiches is that they aren’t really healthy. Most restaurants mix a ton of butter with hot sauce, and that’s how they make their delicious buffalo sauce. I decided I needed to make a slow cooker version that would be healthy and still retain all the traditional elements and flavors. 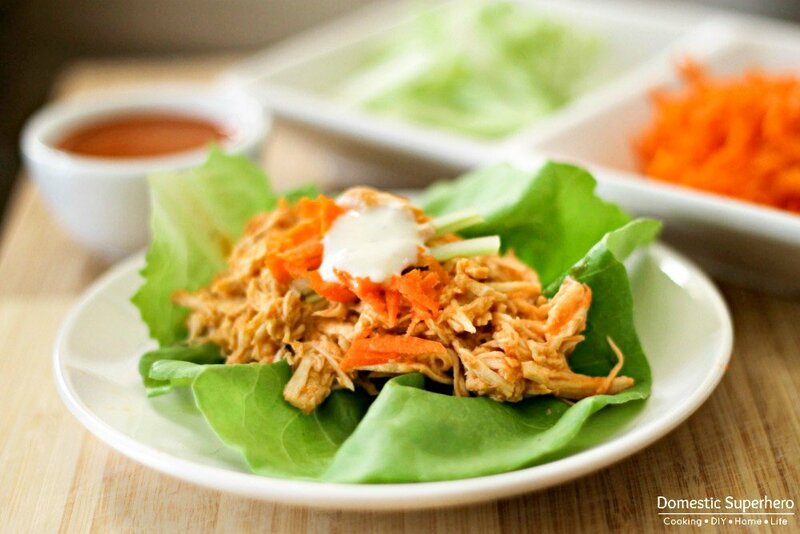 These Slow Cooker Buffalo Chicken Lettuce Wraps keep up all of the essential buffalo chicken flavors, and leave out all the fat, calories, and carbs! Prep all your ingredients, which in this case is just a handful; chicken, celery, carrots, onion, and buffalo wing sauce. Add everything to the slow cooker, and decide if you need to cook on low or high. Set it and forget! If you need a slow cooker, I love this one! The high setting will cook the chicken faster, in about 5-6 hours, where the low setting will take longer, about 7-8 hours. Remove the chicken breasts and shred them using two forks or a stand mixer (simple hack for shredding chicken). Add chicken breasts to a stand mixer’s bowl, then add the paddle attachment. Turn on low speed and watch the chicken shred apart with no effort on your end! Add the chicken back to to sauce mixture in the slow cooker, then mix to coat the chicken. Load the buffalo chicken into the lettuce wraps, then top with desired toppings. Enjoy! Although lettuce wraps are the low calorie choice for this chicken, you could also use wraps (there are many great low calorie/low fat brands), sub rolls, a pita, slider buns, or just use the shredded buffalo chicken in a salad. Easy! Can I freeze Slow Cooker Buffalo Chicken? YES! You could even DOUBLE this recipe and freeze the remaining slow cooker buffalo chicken for next time! Add the cooled buffalo chicken to a freezer safe zip lock bag, then press all the air out and seal. I like to spread the mixture out inside the bag, then freeze with the bag laying down to save room in the freezer. To defrost, place in fridge the night before you’d like to use the slow cooker buffalo chicken. Can I make Slow Cooker Buffalo Chicken in the INSTANT POT? YES! In fact, I have the exact recipe on Domestic Superhero and you can see it HERE! 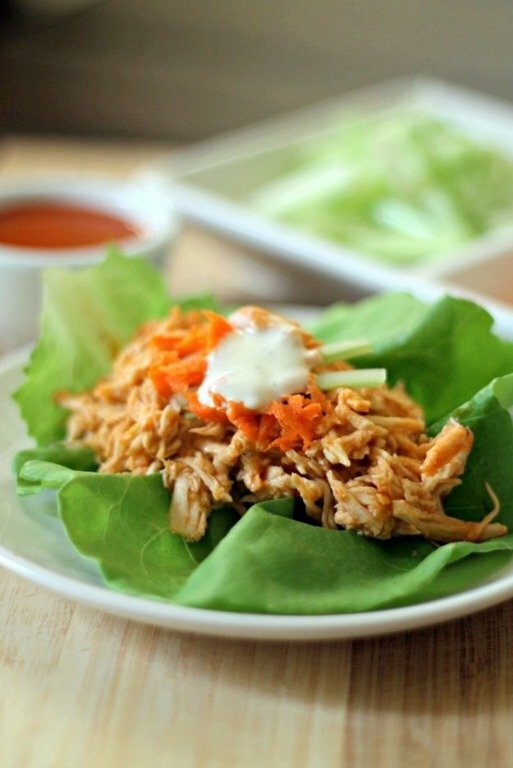 Are Slow Cooker Buffalo Chicken Lettuce Wraps healthy? Yes! 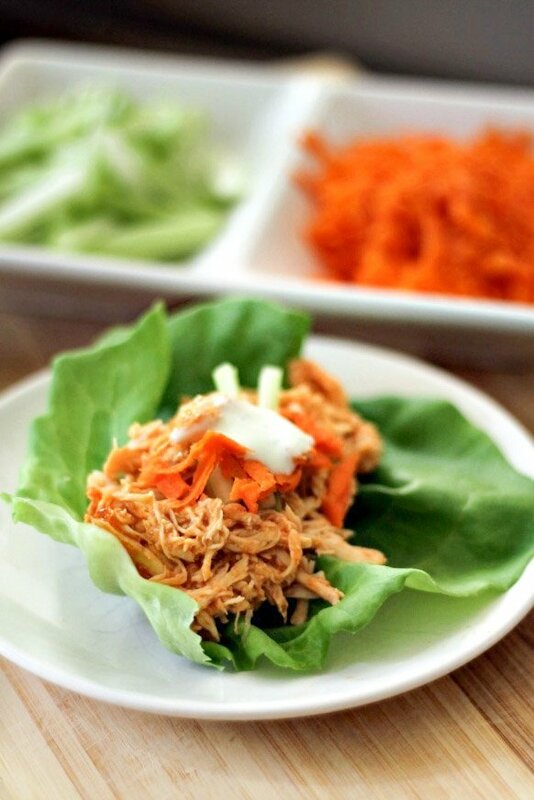 Slow Cooker Buffalo Chicken lettuce wraps are seriously low carb (4 net grams), only 162 calories for THREE wraps, and packed with 28 grams of protein! Slow Cooker Buffalo Chicken Lettuce Wraps are definitely a very healthy option for lunch or dinner! These would even be great at a dinner party! You can checkout ALL of Domestic Superhero’s Slow Cooker recipes for tons of different dinner and dessert options! 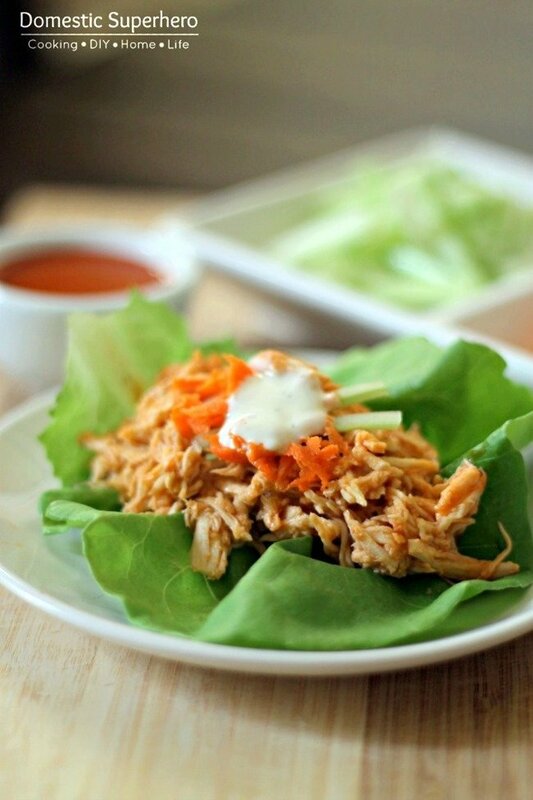 Slow Cooker Buffalo Chicken Lettuce Wraps are healthy, easy to make, and pack a ton of flavor! With tons of protein and barely any carbs, it's the perfect healthy recipe! Add chicken breasts, celery, carrot, onion, and buffalo sauce to the slow cooker. Lightly stir to get sauce under the chicken. Close the top and set on HIGH for 5 or 6 hours, or LOW for 7 or 8 hours. When time is up, remove the lid, then remove the chicken breasts and place on a cutting board. Using 2 forks, shred the chicken. Alternative you could use the stand mixer hack to shred the chicken (see above). Add shredded chicken back to the pot with the buffalo sauce mixture; stir to coat. *Nutritional information does not include ranch or blue cheese topping. 163 calories, 4g fat, 6g carb, 4g fiber, 28g protein. mmm yum. I love Buffalo chicken! These look great! I’m going to pin these and make them later! PINNING! Yet another one of your delicious recipes that I’ll probably be making all the time! Hubby doesn’t do carbs so well, so the lettuce wraps would be perfect for him. Thanks so much for sharing, my friend! I do think you will like this one! It’s always nice to have the lettuce wrap option when you are trying to cut out carbs! 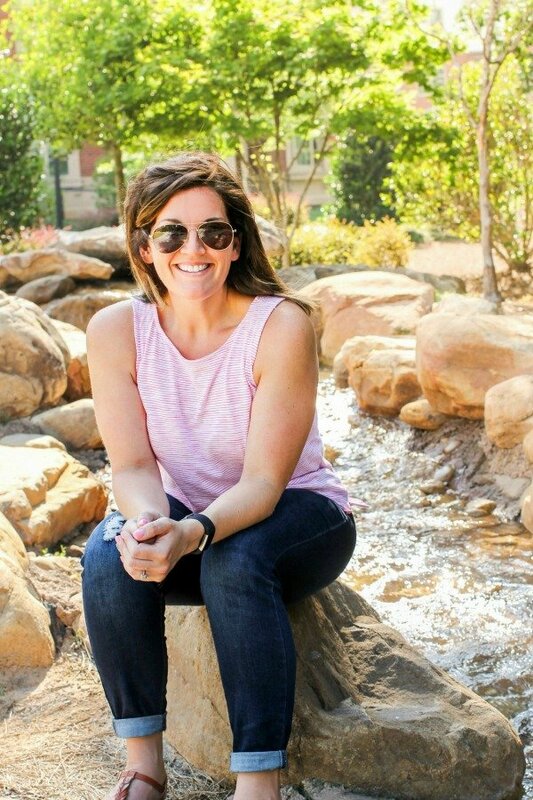 Thanks for coming by, Abby!